Te Akau Shark, How did he get his name? 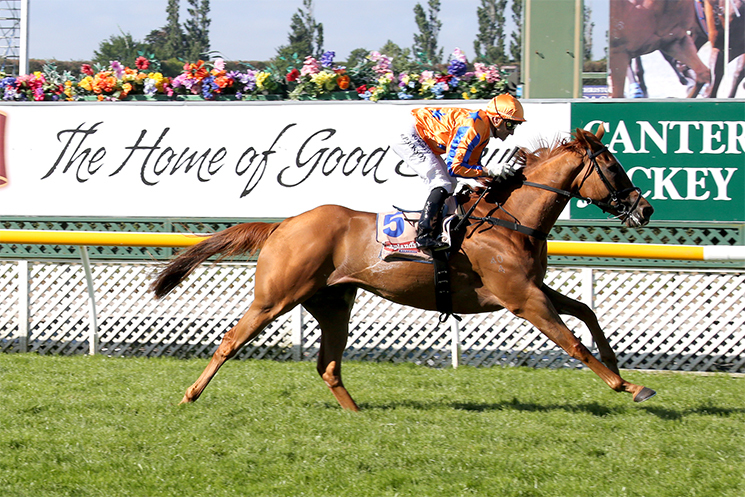 Courtesy of a freakishly talented horse and his charismatic group of owners, the middle day of Riccarton’s New Zealand Cup carnival made headlines on both sides of the Tasman. Cheered on by his band of connections, many of them wearing matching grey shark hats, Te Akau Shark justified his $1.50 favouritism with a jaw-dropping performance in the Gr. 2 Coupland’s Bakeries Mile. Jockey Opie Bosson rode the son of Rip Van Winkle patiently at the back of the field, then brought him to the outside in the straight and turned him loose. The four-year-old exploded past his rivals like they were standing still, blazing to victory by six lengths. Among the team at Riccarton was Cronulla Sharks rugby league star Paul Gallen, who was on-course for the first time as Te Akau Shark blitzed his Coupland’s Mile rivals. “Hopefully he’ll be running around in Sydney, so I won’t have to travel so far,” Gallen said. Trained by premiership leader Jamie Richards, Te Akau Shark has now had six starts for five wins and more than $242,000 in prize-money. He will now be aimed at the prestigious Sydney autumn carnival, with potential targets including the Gr. 1 Doncaster Mile and Queen Elizabeth Stakes. A big step in the Te Akau Shark story came in Hawaii the winter following the 2016 Ready to Run Sale where Te Akau Shark was bought, when Ellis met Sydney businessman Steve Mace. “I’d never owned horses or watched much racing, apart from the odd Melbourne Cup and things like that,” Mace said. “It’s quite a funny story about how I got involved. I actually met Dave (Ellis, Te Akau Racing principal) at a hotel pool in Hawaii. “My first impression was that he was a guy who might be a bit down on his luck, so I bought him a beer. “Dave being Dave, he didn’t want to receive anything without giving something in return, so he came up to me later and wanted to buy me a round. It all developed from there. “When I found out what hotel room Dave was staying in, and that he goes to Hawaii every year, I figured out that he wasn’t so down on his luck after all! I didn’t know anything about horse racing so I went on Google and found out about all the successes he’s had. “Dave said he had one horse available. I said I’d get involved on one condition – I love the Cronulla Sharks, and so the name had to have something along those lines. We settled on Te Akau Shark. Mace and Gallen share ownership with fellow Australians Greg Taylor, Chris Russell, Matt Allenby and Wayne Knight. The rest of the ownership group is made up of Kiwis David Ellis, Jim and Pauline Hepburn, Donna and Robert Rudd and Ruth Redwood and William Thrupp.